John Hastings - I want a comedy night! 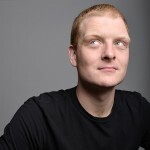 John Hastings came to these shores in 2012 after starting his career in his native Canada where he had won a string of awards since starting in stand up a mere six years earlier. He was the only Canadian to reach the final of the 2011 San Francisco Comedy Competition. John’s move to London certainly worked out well with him landing a job with Radio 4 as their comedy correspondent and appearing in the 2013 Comedy Reserve Showcase at the Edinburgh Fringe. Sharp punchlines pepper his observational storytelling style and have greatly impressed crowds across Europe.